French bread, one of the most iconic styles of all, especially the baguette style. This was bread no. 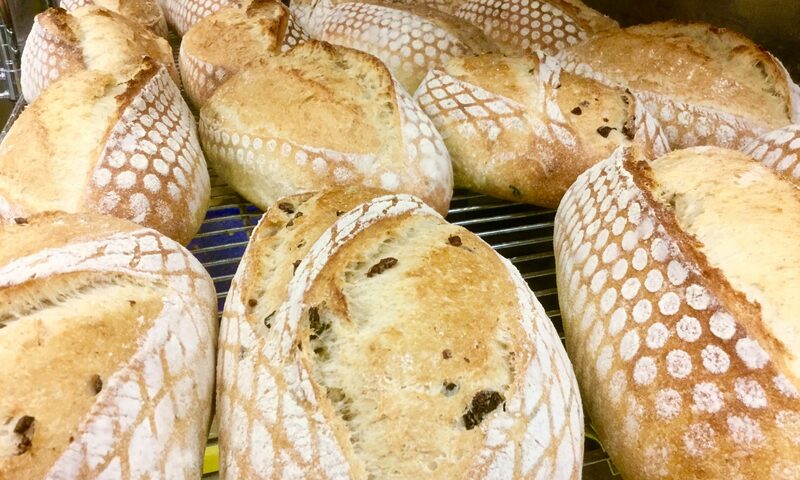 15 in our Hamelman series for the Mellow Bakers. 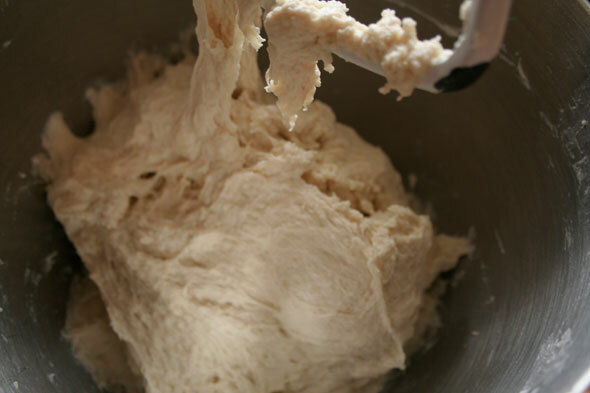 This specific variety is a “straight dough” which means that all ingredients are combined at one without pre-ferments and other secondary steps. 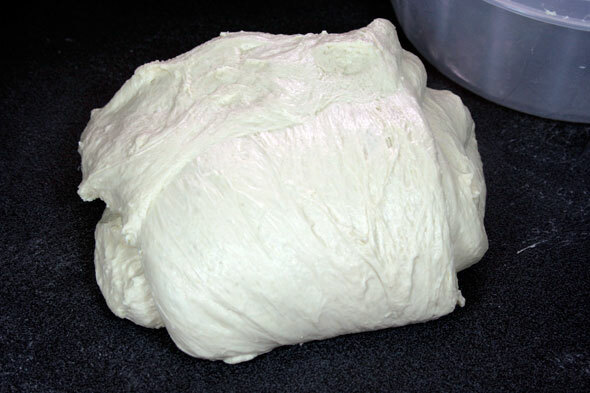 Mix it, proof it, shape it, bake it: straight dough. We drop all the ingredients into the bowl and mix until everything is incorporated. 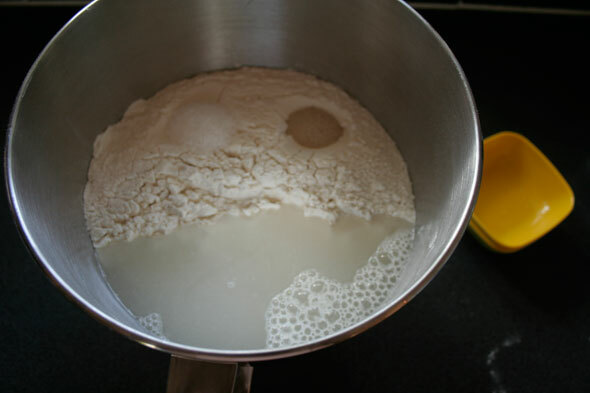 We continue mixing – I swiched to the dough hook here – for just a few minutes longer to the point where we beging to see a little gluten development. We’ll get more development when we do our two or three Stretch and Folds during proofing so we can stop the kneading now. Into a greased bowl it goes for 2½ to 3 hours where will get it’s S&F every 45 minutes – I went with three folds over 3 hours. 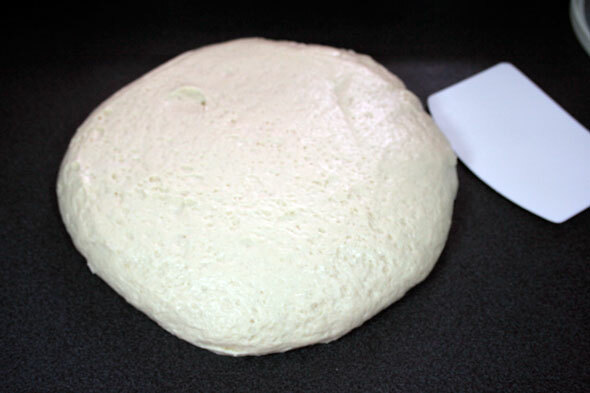 At our first S&F, the dough is turned out onto the counter (note I don’t put flour on it) and once given it’s folds, the dough’s texture is clearly showing gluten development. We’ll repeat this two more time then let it rest a final 45 minutes. 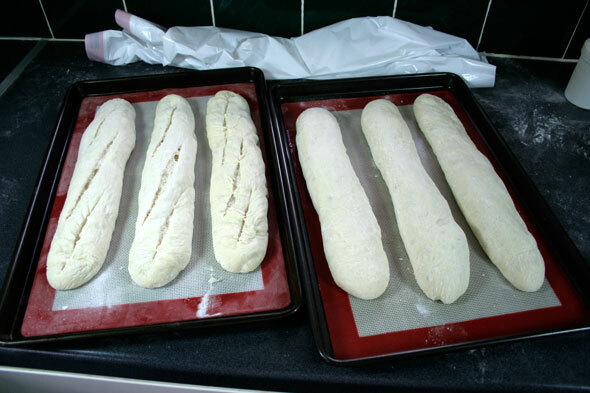 After the three hour proofing, it’s time to divide the dough into smaller portions for our individual baguettes. 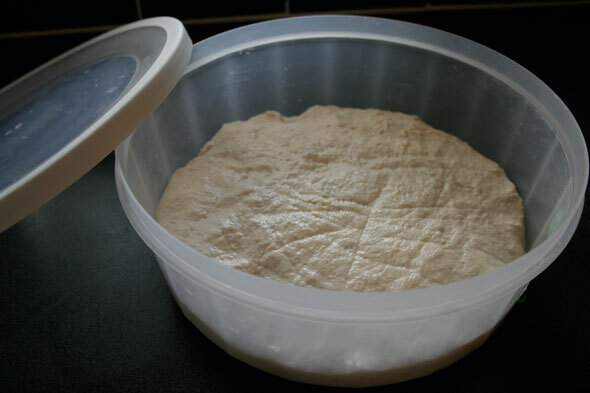 I had weighed the dough when it went into the bowl and dividing that total in eight gave me 194 grams per baguette. 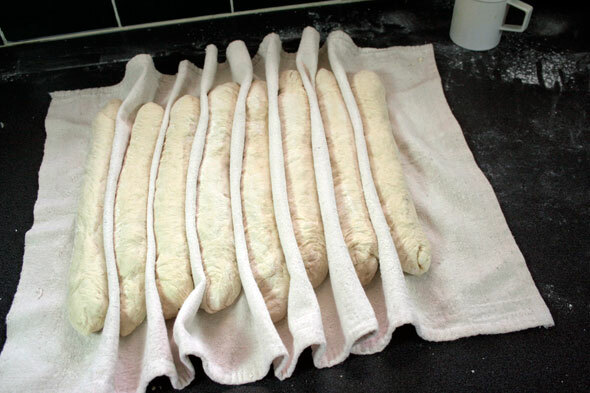 I measured these out and once divided and placed on the pad they were covered and left to rest 20 minutes, at which point they were ready to shape into baguettes. And yes, I am slipping that in hoping you won’t notice I have no photos of me shaping the baguettes. That’s because I was too busy shaping the baguettes to take photos. That’s my story and I’m sticking with it. 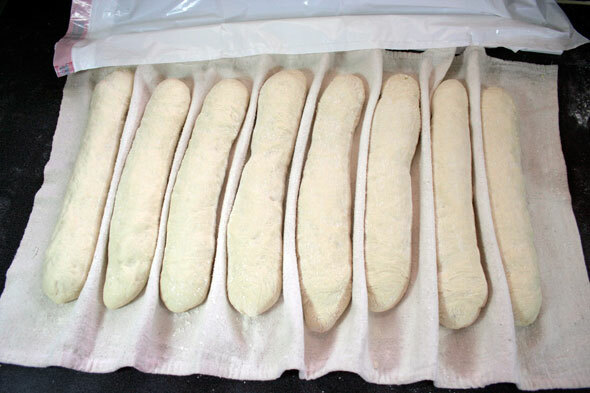 Each “mini” baguette is shaped and placed on the floured couche to proof for 1½ to 2 hours. 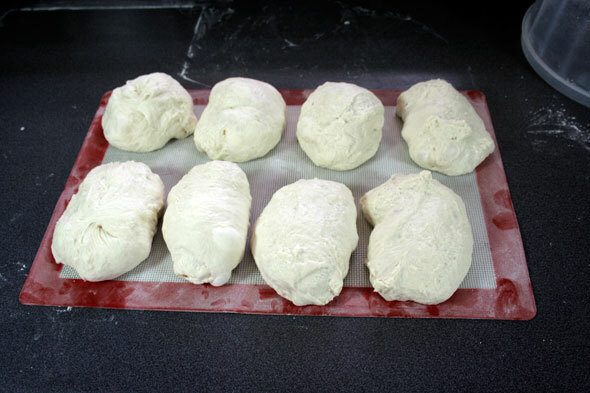 The right hand photo is the loaves when they have completed proofing. You might have noticed that my baguettes are decidedly smaller than the ones Mr Hitz makes. 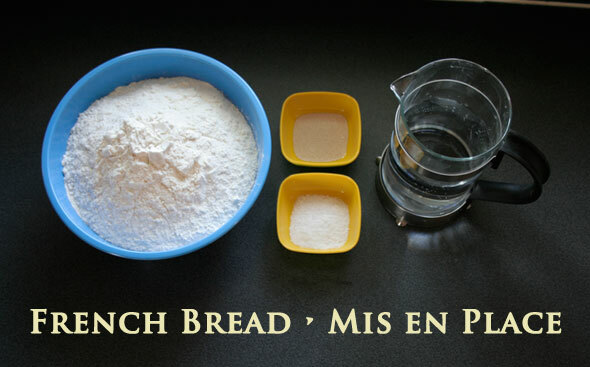 They are also smaller than the ones Mr Hamelman expects from the recipe where each loaf should weigh 390 grams. I made the baguettes 194 grams and about 12 inches (30 cm) long simply because I don’t have space in the oven to make a full-sized 24″ loaf. The final step before placing them into a steamed 460ºF oven is the slashing. 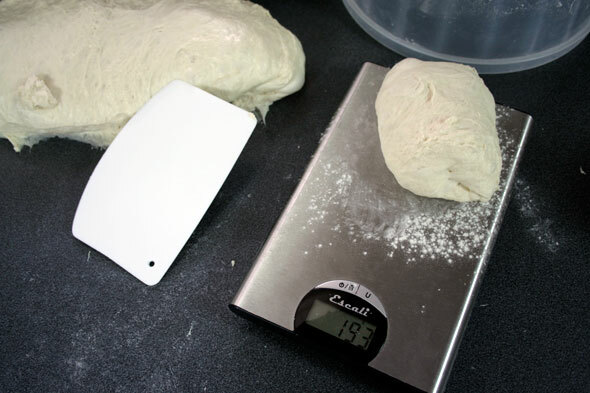 I was having a few issues here with the one-sided razor blade catching in the dough – strictly operator error mind you… The cuts are therefore a little less than splendid. Into the hot oven they went for about 25 minutes. Because I had a third pan with the remaining two loaves, the arrangement in the oven wasn’t optimal – I had expected to put all loaves onto two pans but that proved not feasible at the last moment. So the third pan ended up very close to the top of the oven and baked much more rapidly than the others. Next time, I’ll need to set the oven up a little better before hand. So the final verdict: In looks, there were a few issues that cropped up, all of which are due to the baker, not the recipe. Yet they still looked really decent. As for flavour: They were nice. The crust was light and a little bit soft but still with a little crunch. The crumb was nice and holey, a soft golden colour (I used the last of my unbleached bread, now I have to go through 20k of bleached!!). The flavour itself though was just “nice”, nothing that would make you say “Wow!” if you are familiar with good breads. It’s miles better than the flavourless grocery store versions, mind you. I’m looking forward to comparing these to the baguettes made with poolish and pâte fermentée to see what the difference really is when you make basically the same bread with pre-ferments. So better than mediocre but not stellar. If I didn’t know there was the likelyhood of better breads coming sown the pike, I’d say I would make this again. and more Mellow Bakers here. Nice baguettes! I’ll make these tomorrow for our bbq and will fill them with herb butter. YUM! I thought I had given up on Baguettes…I just can’t get them to look good. Reading this post made me want to try again! Previous PostPrevious Bialys: Little pockets of Yum!